This book is not a traditional poetry book. It is inspirational book. It is inspirational poetry and , it was written to inspire it's readers. This book will help those who desire to have a closer walk with the Lord and it will be a help to those who want to know more about God. This book was written in the form of a daily devotional, though there are a few differences. It does not focus on daily passages but it focuses on topics which a person may want to learn more about. There are section headings, topics, poems, scriptures and prayers. Each section has a variety of poems which relates to the section heading and each poem also has a related scripture. The poetry in this book was inspired by God and his holy word. Each poem relates to the section’s overall theme. Directly below the poem is the scripture that it was inspired by. Also included are suggested prayers relevant to the topic’s theme. The poems have universal appeal. They flow well and can be used for further study in a particular topic area or for general inspiration. Readers can use the material to enhance their times of prayer and Bible studies. Any Christian desiring a deeper relationship with God will find the poems inspirational and motivational. God’s Poetic Treasures is written in a way that the reader is able to fully understand the point and meaning of the poems. Author Pricilla McGee prefaces each poem with a scripture, given the reader a concrete direction, leading to the poetic interpretations of God’s word. 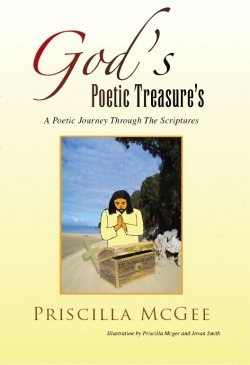 God’s Poetic Treasures would be a worthy addition to a library of inspirational works. ​God's Poetic Treasures has definitely helped me through some difficult times. Whenever I face an obstacle, one thing I like to do is choose a topic from the book and read it. I love how the poems reflect a specific scripture in the Bible, and also helps break down the meaning of the Scripture. I would definitely recommend those who do not have this book, to go and purchase it! Thank you, Author Priscilla McGee! "It is a joy to read the scriptures offered in this little poetic treasure, to see the writers own thoughts embossed by the heart of a poet, the intellect of a wise woman, and the faith of a believer."